ECONS is a joint project of the Potsdam Institute for Climate Impact Research, the Leibniz-Institute of Freshwater Ecology and Inland Fisheries, the German Institute of Economic Research and the Weierstrass Institute for Applied Analysis and Stochastics. It is sponsored by the Leibniz Association's "Joint Initiative for Research and Innovation". 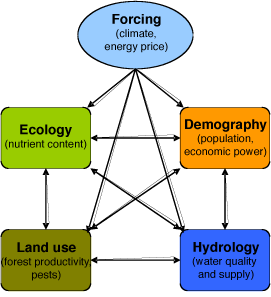 In this project, "Evolving Complex Networks" (ECONS) form an interdisciplinary connection between various disciplines to for the first time cross-link models from socio-economy, land use, ecology, hydrology and climate in a system-theoretic way. It was shown in recent theoretical research, that ECONS generate a rich variety of structures and provide a qualitatively novel approach for describing large and complex systems such as the human brain or metabolic cycles. Within the ECONS project, this paradigm will for the first time be systematically applied to all relevant aspects of the Earth system. A particular challenge for this application is posed by the diversity and complexity of the subsystems. The goal is (I) to describe the macroscopic global behavior of the Earth system as well as (II) to resolve and investigate regional developments in land use, ecology and population movements (rural exodus) under the influence of rising energy prices, climate change and an aging society. A crucial aspect is to analyse the stability of the whole coupled system to be able to estimate price stability, profitability and security in case of crisis for different development and decision pathways. Furthermore, feasible strategies for controling the system are to be derived.